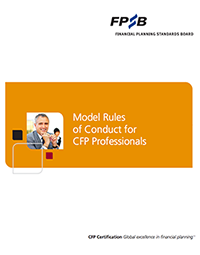 Model Roles of Conduct: FPSB’s Model Rules of Conduct establish standards for the level and type of conduct expected of CFP professionals. Once adapted and applied by a FPSB Member, the Rules of Conduct serve as the enforcement mechanism for the Code of Ethics and Professional Responsibility and Financial Planning Practice Standards. A FPSB Member’s Rules of Conduct are binding on all individuals who have the right to use the CFP Marks in a territory, whether or not the individuals are using the marks. CFP professionals must be knowledgeable and aware of all territory-specific Rules of Conduct and must apply and abide by rules that are relevant to the CFP professionals’ activities. Violations of the Rules of Conduct may subject a CFP professional to discipline by a FPSB Member. FPSB Members adopt territory-specific conduct rules that reflect the scope and intent of FPSB’s Model Rules of Conduct, adapted and augmented to meet appropriate definition and coverage of professional conduct requirements in a given territory.